Cementitious Coating 851 ... durable barrier. Flexcrete Technologies asserts that its Cementitious Coating 851 provides an effective barrier to chlorides for decades, and backs its claim with a reference project and lab results. 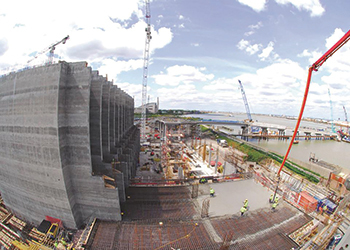 “Chloride attack is one of the primary causes of damage on reinforced concrete structures and independent tests have confirmed that Flexcrete’s Cementitious Coating 851 provides an effective barrier to chlorides for at least 28 years,” says an official for the UK-based company. In 1988, a 2-mm-thick film of Cementitious Coating 851 was applied to a concrete slice and sealed in a chloride ion diffusion cell and it is still going strong some 28 years (10,179 days) later. Ongoing tests carried out in the laboratory at the Vinci Technology Centre in Bedfordshire, UK, show that the barrier properties of 851 have not changed after a test period spanning the ongoing 28 years. Chris Lloyd, director of Flexcrete Technologies says: “We have been advised that the performance of Cementitious Coating 851 in this test is unparalleled. Not only has the coating shown minimal permeability and constant yet very low diffusion coefficients, but it has not shown any signs of deterioration despite being fully immersed in the chloride solution for over 28 years. Cementitious Coating 851 is a highly advanced, two-component, waterborne cementitious modified polymer coating which was originally introduced by Flexcrete back in 1985, and it still remains one of the most effective products for providing structural protection against chloride attack. It is specified on both existing and new structures to waterproof concrete, reinstate concrete cover and provide an effective barrier to chloride ingress, amongst many other challenges typically encountered on buildings, infrastructure and structures in coastal, highways and water-related applications. A 2-mm coating of Cementitious Coating 851 is equivalent to 100 mm of good quality concrete cover, the company claims. “From Vinci’s experience, many coating systems tend to degrade over time when on test in the cell. Even products that initially perform well can subsequently blister, resulting in more chloride ions passing through the product. Following the latest investigations and studies in concrete technology, Vinci’s internal testing can now determine a chloride ion diffusion coefficient from non-steady state conditions,” says Lloyd. Cementitious Coating 851 is said to resist 10 bar positive and negative pressure under a 100-m head, forming a hard, highly alkaline coating which not only protects concrete from the effects of aggressive acid gases, moisture and chlorides, but also has greatly enhanced chemical resistance. It has been extensively used on the UK’s Crossrail developments and all around the world on projects, such as at Abu Dhabi International Airport, the Gorgon LNG Project in western Australia and Hong Kong’s West Kowloon Expressway. It provides an effective alternative to recasting or even demolition of precast and in-situ reinforced concrete, where the cover to the reinforcement has not been achieved to give the durability to attain the specified design life. Being cement based, Cementitious Coating 851 chemically reacts with the substrate to form an integral part and will have a design life equivalent to that of the concrete to which it is applied. Coating 851 can be applied to either green or aged concrete by brush or spray techniques, exhibiting minimal hazard during application, and is non-toxic when cured. “It is CE-marked in accordance with BS EN 1504-2, the pan-European standard for concrete repair, and it is also backed by British Board of Agrément (BBA), Water Regulations Advisory Scheme (WRAS) and has London Underground approval,” says Lloyd. Flexcrete Technologies, a manufacturer of technical mortars and high-performance coatings, has a global presence through international agents and distributors in 65 countries worldwide with export sales accounting for more than 50 per cent of its business.